Shelby D. Hunt is the Jerry S. Rawls and P.W. Horn Professor of Marketing at the Rawls College of Business, Texas Tech University, Lubbock, Texas, USA. A past editor of the Journal of Marketing (1985-87), he is the author of numerous books, including Foundations of Marketing Theory: Toward a General Theory of Marketing (2002), Controversy in Marketing Theory: For Reason, Realism, Truth, and Objectivity (2003), and A General Theory of Competition: Resources, Competences, Productivity, Economic Growth (SAGE Publications, 2000). One of the 250 most frequently cited researchers in economics and business (Thomson-ISI), he has written numerous articles on competitive theory, strategy, macromarketing, ethics, relationship marketing, channels of distribution, philosophy of science, and marketing theory. 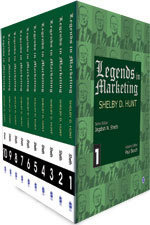 Three of his Journal of Marketing articles won the Harold H. Maynard Award for the "best article on marketing theory." His 1994 Journal of Marketing article "Commitment and Trust," with Robert M. Morgan, was the most highly cited article in economics and business in the 1993-2003 decade (Thomson-ISI). For his contributions to theory and science in marketing, he has received multiple other distinguished awards.